The modernisation of myth is proving a popular theme in fringe theatre this autumn but it’s not always an easy thing to communicate with clarity. 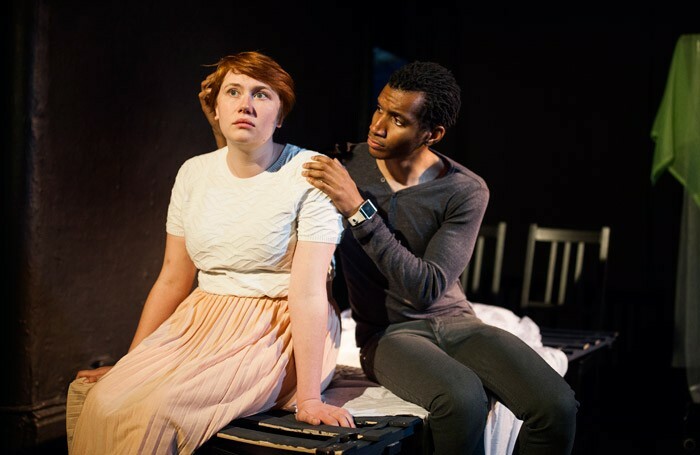 The story of Tereus, Procne and Philomela isn’t the best-known tale from Ovid’s Metamorphoses either but Eliza Power’s family drama Feathers wears its classical influences lightly, being a character-led domestic drama leading up to a tragic climax. A more obvious point of comparison is A Streetcar Named Desire: Edie, a troubled young woman pays an extended visit to her unhappily married sister Marisa. Her mutual loathing of her boorish brother-in-law Dan develops into an inexplicable attraction, culminating in a terrible act of violence. As the gauche Edie (it’s hard to believe that her sister would trust her with her baby), Eleanor Wright has a way of appearing very young and older than her years at the same time, while Carrie Marx’s brittle Marisa appears the sorted older sister but is just as lost in being unable to shake off her volatile marriage. Ben Mann is unnervingly menacing as a bourgeois brute, venting his insecurity by saying whatever comes into his head, no matter how offensive (tact is something that all three protagonists lack in spades). Milla Jackson’s frills-free production is well suited to Power’s preternaturally mature debut play (she wrote the first version in 2010 at the age of 23). The destructive power of words is at the heart of the bruised relationship between the two sisters, something that proves as impossible to heal the mauled birds that Edie finds in the family’s suburban garden.